It’s been so long since I last wore my buttondowns this way. I usually wear them buttoned up all the way. But since it’s summer and I want a more casual and less preppy look, I left a few unbuttoned. It may seem like such a small thing but it’s the small details like this that can make or break one’s look. Agree? 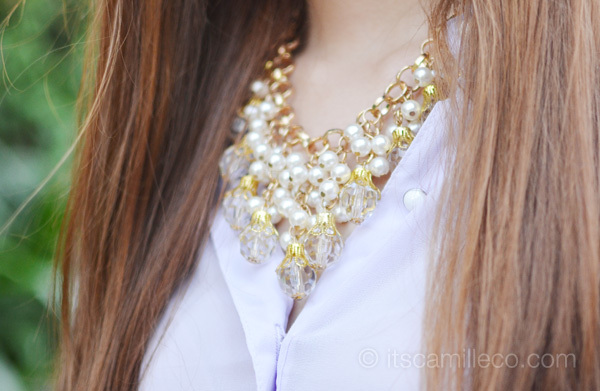 Plus, I wanted to show off my beautiful pearl necklace. Florals and pearls, can I get even more girly? What I love most about my top is its color. I just noticed that I can count in one hand the number of lavender/lilac clothes I have in my closet. I’m actually a little surprised to find myself choosing more and more lilac/lavender-colored clothes, especially after my recent addiction to anything fluorescent. Talk about extremes, from all things bright and neon to pastels! P.S. If you still haven’t joined my latest giveaway with Call It Spring, what are you waiting for? Deadline for entries is today so hurry and join! I want to meet you! Elegant!! I love your outfit so much. Thanks Veronica! I think you have to find out what material is causing this so that you can find a replacement–like if it’s plastic? Metal? Steel? Hi, Camille! :) Do you know what models your Balenciagas are? I’m trying to decide between the City and Part Time but I’m having such a difficult time! (Haha what a #firstworldproblem right?) I’ve been stalking your collection for a little help. If I’m not mistaken you have a blue-grey Velo, a red Part Time and the City in beige and black? Thanks Nessy! Sugarfree has nice shoes! 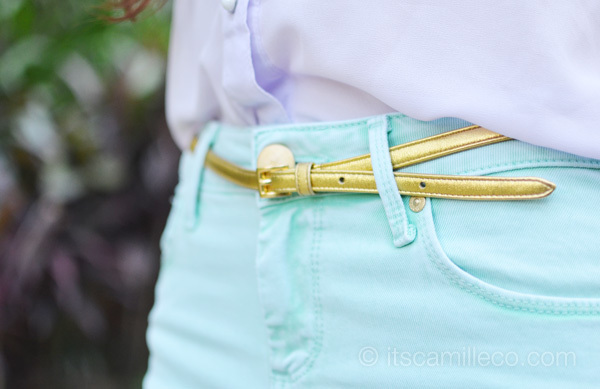 Absolutely love, love the pastel mix of this! If someone is petite and thin, how can they pull off wearing a loose georgette blouse? love your shoes! when will you raffled one up? hihi. uh oh. girls might be raving to get a pair. tsk tsk tsk. dont tell them , ok? it’s our secret from now huh? so, would you share them unto me? for free? haha! love the bag and the lipstick! what color/brand is that?? I love this look! Definitely cools down the feel of a hot weather! I know! It’s so hot nowadays! Awww sorry but I love them too haha! love the combination of floral and pastels!! sweet and girly!! perfect for summer!!! I don’t know! :) I honestly don’t know. As for a boyfriend, I’m single! i love your outfit, simple but very classy! :) everything is fabulous can you suggest some brand for pants that is affordable and can be bought just here in the Philippines? oh wow, i love pastels for spring (better than the neon trend) – easy on the eye and kind of changes your mood into a more calmer state! and i think people are more approachable in this color, or maybe it’s just me. anyway, very well put together. that top is really cute – i think you do a very good job at advertising, as i found my way to a website that sells that. Everything looks so good on you Camille! I love your effortlessness behind so much effort. What? Haha. Hahaha I understand what you mean. :) Thank you Antoniette! I love the colors in this outfit. You always do the best color combos! I don’t even know! I bought it from Balenciaga in Paris. :( I’m so sorry! love your makeup! and such lovely outfit! this outfit is so summery! This pants fits you perfectly!! Will you participate in the Bloggers United Bazaar this June? I so envy you for your bags. 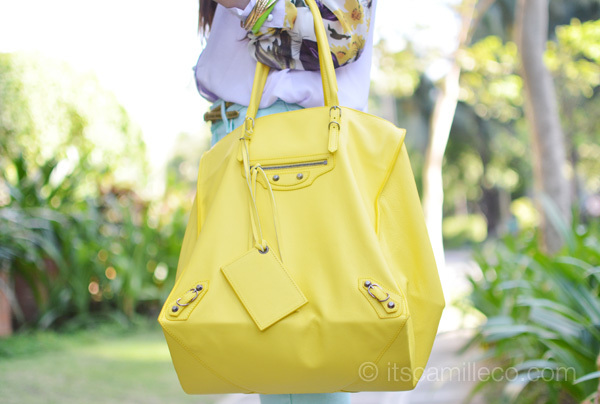 You have lots and different types of Balenciaga bags!! So jelly. Hehehe :) Anyway, I super like your top and pastel pants. Simple yet very pretty! Hi camille! :) I just love the way you dress. BUT I think it’s over the top. Not naman the way it was styled. Over the top because super expensive ng clothes, shoes, bags, and accessories mo. (hay the life of you guys who are wealthy T.T) Now, I’m challenging you to reach out to us, your readers, by dressing up in a “practical” way. Sana you could dress up with a budget of Php 1500? :) just that. FROM HEAD TO TOE AND WITH NOTHING SPONSORED. Thank you! :) Looking forward to that ah? Hi April! It’s usually just my bag or shoes that are expensive. Most of the accessories I have on are really super affordable. I like mixing and matching high low items but let’s see! So lovely, the sleeves are fab! omg! i superrrrrrrr love ur pants & top! Your pastels get-up looks so cool that it’s hot! I agree! They are! :) Thanks Jeline! Thanks Gervin! :) I’m in love with pink lippies!